Connemara ponies are loved by everyone in any discipline! Penny Smith, Chairman of the British Dressage Supporters Club, loves hacking out on the North Downs in Surrey on her ‘gorgeous’ connemara pony Callum. 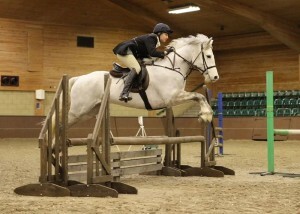 She says ‘I’m really lucky as he is beautifully schooled, loves to jumps and is known at the yard as PP – perfect pony! 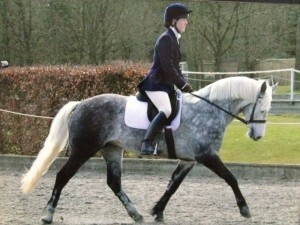 On Sunday 14th April 2013, five teams of Connemara ponies competed at the NPS Dressage Finals at Addington Manor. Three teams competed in the Prelim 12 and two in the Novice 27, with each rider also competing individually in their arena. There were so many Connemara entries that they had their own dedicated arena for both tests! The scores were then added together and the top 10 riders stayed for an unmounted presentation at the end of the day – from our teams, 7 ponies from Prelim and 4 ponies from Novice were in the top 10! As Julia Woods on St Flannans Aodhan won both Prelim and Novice, they were asked to perform a freestyle test to music to decide the Supreme Championship. The standard was extremely high and St Flannans Aodhan was crowned 1st Reserve Supreme! The Connemara Charms team won the Prelim team competition, out of 23 teams entered – team members were Julia Woods on St Flannans Aodhan, Gillian Hasberry on St Flannans Sorcha, Claire Cornwell on Tyan Tyriana and Sarah Webb on Wefan Saskatoon. The Connemara Rebels team were placed 7th in the Prelim team competition, with team members Louise Johnson on Croftbank Finnella, Sarah Fortune on Mundon Twilight, Gillian Hasberry on Kilmiston Night Hawk and Patsy Drake on Alfie. 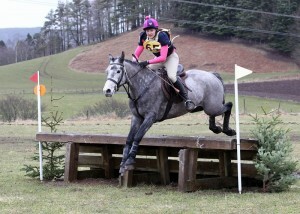 Many congratulations to all riders and ponies for doing so very well! With the start of the eventing season, two ponies – Breaffy Delight and Eques Junior – have really exceeded their owner’s expectations! First time cross country, only five years old and coming 14th and 18th respectively in the Kieriemuir BE 90 section of the Horse Trials. Both ponies did decent dressage tests scoring 35 & 39.5, both had one showjump down and both clear cross country with time penalties. James Helyer could have not been more pleased with both his daughter and her two rides! Louise Helyer was doing her first BE event in 10 years, and they definitely plan to do more this season, moving up to BE 100 if all goes well. James tells me he bought them as 4 yr olds, and that they are such lovely characters! Obviously Louise has put in a lot of work over the past year to do so well in their first event. Well done Louise and James – good luck in the future! During the winter showing season, Mathew Lawrence scored a double with his two Connemara rides at Stretcholt’s Winter Show. Judge Sue Phelan chose Tulira Dardg for top spot in the novice class and Blackthorn Passion in the open class. Matthew opted to stay on Passion for the championship, when Dardg was ridden by Gemma James to claim the title. The Tulira Connemara Stud is located in Ireland and Gloucestershire and run by co-owner Serena Cookson, whose grandmother Lady Anne Hamphill founded the stud and is based in Ireland with the renowned connemara stallion Tulira Robuck, Dardg’s sire. Judge Sue Phelan commented: ‘my champion has a super temperament and is true to type, with lots of timber. For a stallion he was impeccably behaved for his first outing. I expect both him and my reserve – a lovely mare – to go on and do very well’. Blackthorn Passion is by former Olympia ridden champion Bunowen Castle Ri, bred by Jackie Webb. The 6 yr old did well in-hand, winning at the Royal Show in 2009, and she has won every time out in Picton classes, but hasn’t yet been aimed at RIHS or HOYS qualifiers. ‘I’ve kept her as a novice to give her time to mature, but she will possibly go on to do the qualifiers later in the year’ said Mathew. In showjumping, at Ingleston, Alex Gill celebrated his birthday weekend with victory in the Peace, Love, World Pony Adventurer class on his new ride Wildwood Silver. They finished marginally ahead of local rider PJ Williams with Just Dolce. ‘He’s a super sort who’s won on all three of his last outings’ said Alex. At the Arena UK Large Pony Premier show, Emily Ward and Prospect Eddie achieved 2nd place in the first day’s JC qualifier after an electric jump off over Di Boddy’s up to height and technical track, and the following day Scarlett Worrow and Dancing Hero did the same – both just being ‘pipped to the post’ by Millie Allen on Unorthodox Blue, who was in scintillating form. 15 yr old Scarlett was ecstatic with her place ‘I’m a bit starstruck after being in that line up. Compared with showing, it’s so much harder to get placed, let alone win, in showjumping’. Prospect Eddie was in excellent form at the Addington Manor Pony Premier show also, taking the Winter JC on both days, with a tight jump-off time giving few clears in the Sunday class. Emily executed every conceivable inside turn, and stated ‘he’s ‘Mr Consistent’, is usually in the third round and is seriously fast at turning!’’. Georgina Heeney on Gurteen Champ jumped the sole double clear in both the Blue Chip Coral and JC/JA Pro Sparkle at Quob, Hampshire. What seemed a straightforward track from Matt Hoskins produced only two clears in the first round. Georgina said ‘the first round was quite technical, though it seemed straightforward when I walked it. The spreads were quite wide and I think that was catching some people out – you had to ride positively’. She had already qualified for the Sapphire and Pro Sparkle, and now she has the Coral qualification too. 7 yr old Gurteen Champ has been owned by Georgina for four years. She said ‘It’s my final year in juniors and I’m aiming to qualify for HOYS as I’d like to make the most of it. I jumped my final Foxhunter double clear today, so now we’ll do second rounds’. In dressage, at the South West Winter Regional Dressage Championships, Sara Squires returned to her happy hunting ground on Linda Penfold’s 15.3hh part-bred connemara Irish Dream to head the medium restricted class. Sara said ‘He’s a super consistent little horse’! Clare Day and Ninja II won both elementary tests at Sissons Farm, Cambridgeshire, scoring 65% in elementary 42 and 64% in the elementary 49 qualifier. The 11 yr old connemara x TB was bought as an allrounder, but Clare has recently been concentrating on flat work. ‘I was bitten by the dressage bug taking my daughter to shows’ said Clare, ‘and now I’m addicted. We’ve been working on transitions within the paces to encourage Ninja to engage behind more, and he’s become stronger and finds the work easier’. Amanda Bowie, who piloted the 10 yr old connemara The Silver Spirit to 69.72% in the novice freestyle at Rowallan, trains with Jane Rutherford. ‘Alfie had a Rolfing (holistic therapy) session with Pauline Kidd last week’ said Amanda. ‘I can see a real difference and it seems to make him feel good. In showing, at the Heart of England show, 19 yr old Lauren Campion and Chilham Aquarius took reserve in the Heritage Pretty Polly section and booked their place at Hickstead. The 8 yr old gelding by Castle Comet out of Chiltern Quota is home-produced by Lauren, who works full time in the family business making brow bands for the Mrs Candy equestrian range. The pair also had a fantastic P(UK) winter, taking two championships and RIHS qualification in the intermediate and large breed sections. Competitors in the outdoor working hunter ring had testing weather but Paul Thompson’s up to height twisting track jumped well. Champion was Matt Cooper from Yorkshire with his partner of five years Mirah Kilgobben Rebel, a 16 yr old by Westside Mirah, who won the intermediate workers section at the RIHS in 2010. Matt said ‘he can be very quirky – but he is an out-and-out performer and loves a big track’.